Cowboy Boots Are Making a Comeback! Attention friends!!!! Cowboy boots really are making a comeback!!! And…I couldn’t be happier! Way back in the 90’s when I was living in Arizona, I fell in love with cowboy boots. We wore them a lot back then, especially there! They fit in with everything! I even owned some white lace ones that I wore to a function for Ballet Arizona! I wore them a lot for a few years, probably in to the late 90’s. And then……well they just sort of went away. I just didn’t ever feel like they were hip enough to wear anymore. I ran in to this article a month or so ago in Glamour Magazine. And since then have seen cowboy boots here and there. I’m hoping they will stick around for a while. You might say, if YOU LOVE COWBOY BOOTS, you shouldn’t worry whether or not they are “in style”. And I do agree with that, however that’s not me. I want them to be “IN”, unless however I’m in Santa Fe, or Taos, or Vail Colorado. I’m SO EXCITED to start wearing these again and bring them current! These were one of the first pairs I ever got. You can see even way back then, I was drawn to COLOR! I love them mostly styled with jeans, but would also wear them with a denim dress or skirt. I’ve linked some other ideas below. Would you wear cowboy boots? How would you style them? My FAVORITE PLACE to shop for cowboy boots….they even do custom, is called BACK AT THE RANCH in Santa Fe, New Mexico. Even if you don’t like boots, it’s a really fun store to see!!! 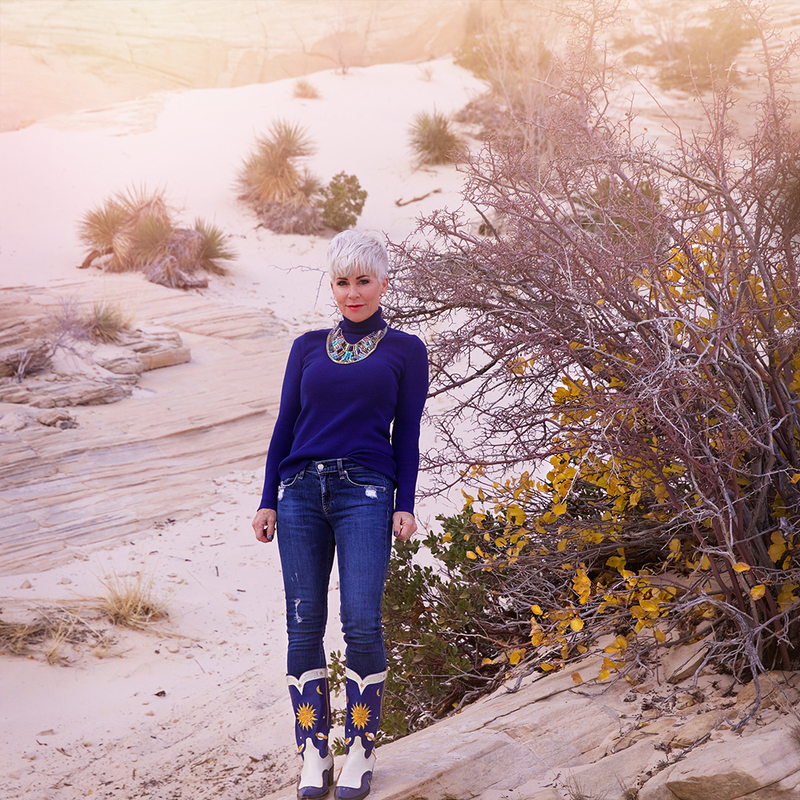 I’ve styled mine here with Chicos Coolmax Turtleneck and my favorite jeans. My statement necklace is also from Chicos but vintage. They have such FUN jewelry. You can see their collection right here. This is a good site to shop REAL COWBOY BOOTS! Im so glad to read that they are coming back as I’ve had some in my attic for 8 years or so just waiting. Cowboy boots never go out of style in Texas. I wore my shiny silver pair just last week to church! With a long black dress and fur vest! I have a gorgeous pair of teal boots with beadwork. I love wearing them! CAN YOU TELL ME WHERE I CAN PURCHASE THEM. THEY ARE GORGEOUS!! True confession here ladies. I love cowboy boots so much that I don’t care if they are in or out. I grew up in Oklahoma where of course we were practically born in them but now I’m in Atlanta where they don’t make much sense unless you are riding. But I wear them anyway. I wear them to the office on Fridays with my favorite jeans & I always get compliments. You should see what casual day brings out in people. Cowboy boots are chique & almost classic compared to the Lady Gaga bizarre heels I have seen! So if you love those boots ladies, wear ‘em. Maybe we’ll LEAD the cowboy boot wearing trend this time! We at Back at the Ranch know cowboy boots are here to stay! We love our cowboys and cowgirls! !